Congratulations! As a clinician who has chosen to work in migration health you have entered a unique and rewarding clinical care environment. Working in migration health is both gratifying and challenging, requiring clinicians to understand far more than straightforward clinical procedures. To maximize effectiveness it is critical to be aware of the unique needs, strengths and circumstances of migrant patients. 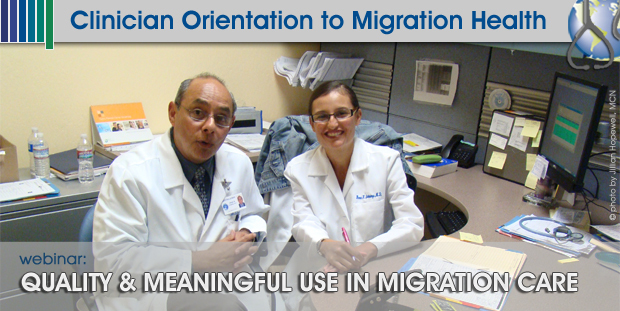 Migrant Clinicians Network has designed this Clinician Orientation for new as well as seasoned clinicians who are interested in understanding more about the migrant population. The orientation is divided into a series of seven webinars which cover a wide breadth of knowledge and skills to help clinicians provide quality care to one of the most difficult to reach populations in the United States. Accompanying the webinars are links and resources for those who want even more in-depth information about the topic. Each presenter has many years of experience in migration health and brings the very best in cutting-edge skills and knowledge to this effort. Emphasis is placed on practical solutions to the difficulties that arise at the intersection of migration, poverty and health. Each webinar is accredited for an hour of Continuing Nursing or Continuing Medical Education. Complete all 7 webinars and you will receive a Certificate of Expertise in Migration Health as well as 7 full hours of free continuing education. This series, Clinical Orientation to Migration Health, which took place February 13, 2013 - August 15, 2013, is acceptable for up to 7 Prescribed credits by the American Academy of Family Physicians. Physicians should claim only the credit commensurate with the extent of their participation in the activity. I am a Migrant Too! There are millions of workers who live on the move. They do the jobs that most will not. They go where the work is—fields, factories, construction sites— and take enormous risks in order to survive in the hope of a better life. At the same time, there is a group of clinicians who are committed to serving these workers and their families. “We depend on misfortune to build up our force of migratory workers and when the supply is low because there is not enough misfortune at home, we rely on misfortune abroad to replenish the supply,” President Harry S. Truman, 1951. Truman's observations are as true today as in 1951. Migrant laborers continue to function at the bottom rung of the American economic. They are often newly-arrived immigrants with few connections, or individuals with limited opportunities or skills, relying on farm and other manual labor for survival. This session will provide an overview of the key issues at the intersection of migration, poverty and health. Discuss historical impact of migration in a global context. c. Describe current changes in migration patterns in the United States. d. Identify challenges health centers face in providing quality health care to mobile patients. Identify the unique challenges facing migrants at the intersection of poverty, migration and health. 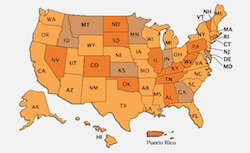 Describe current changes in migration patterns in the United States. Identify challenges health centers face in providing quality health care to mobile patients. The need for cultural proficiency pertains to both individual clinicians and staff as well as to the health care organization as a whole. Cultural proficiency in practice requires that one be a continual learner. Cultural humility and a desire to better understand your patients are essential. Models for improvement suggest that we often make the greatest progress by taking a series of small steps and pausing frequently to assess if that step is a step in the right direction. In this module participants learn the impact of cultural proficiency on health care quality, how to recognize personal and organizational biases, and how to improve care delivery to those from migrant and immigrant settings. Define culture and cultural proficiency. Identify biases in health care delivery based on cultural factors. Hypothesize how individual biases affect interpersonal interactions. Identify strategies for identifying and improving cultural issues in health care to migrants and immigrants. Clinicians serving migrant farmworkers often work in isolated rural areas, frequently without easy availability of specialist consultation. At the same time, the population of migrant farmworkers are at high risk for numerous health conditions. Living and working in substandard conditions puts migrants at greater risk for the development of communicable disease or uncontrolled chronic disease. Lack of access to resources and health care increases the risk and challenges associated with these conditions. This session will review the critical infectious and chronic conditions impacting migrants. This will include a discussion of tropical disease, tuberculosis, parasites, and chronic conditions such as diabetes and hypertension. Identify the unique challenges that migrants face whether confronting an infectious disease or a chronic condition. Describe what primary care clinics in the United States can do to develop systems to identify, treat and prevent tropical diseases. Describe resources and expert networks where additional information can be found on diseases disproportionately affecting migrant populations. Discuss strategies to effectively provide continuity of care to a mobile patient population. Migrant workers are often employed in some of the most dangerous jobs in the United States including agriculture, fishing, forestry and other low wage jobs. Factors such as lack of training, poor safety precautions, regulatory exclusions, lack of health insurance, language barriers, piece-rate pay, undocumented worker status, and geographical and cultural isolation can put these workers at increased risk for occupationally related injuries and illnesses and chronic sequelae. Exposure to pesticides and other contaminants is a particular concern to migrants and their families. This session will use case studies to overview health risks facing migrants as a result of their working conditions and environment. It will review the long history of regulatory exclusions and its impact on migrant health. It will also highlight promising practices for the incorporation of environmental and occupation health in the practice settings, showcasing successful initiatives employed in Community and Migrant Health Centers. Lastly, this session will review and show participants how to access clinical and patient education resources and tools to address worker health. Overall, participants will become familiar with the importance of and methods to integrate environmental and occupational health into the practices settings from both a clinical and social justice perspective. Recognize the unique health risks of migrants due to their working conditions and environment. Identify promising practices in environmental and occupational health that are feasible to implement in Community and Migrant Health Centers. Utilize online clinical and patient education tools and resources to recognize, prevent and manage environmental and occupational illnesses and injuries. MCN's Pesticide Comic Books - ORDER NOW! Amy K. Liebman serves as the Director of Environmental and Occupational Health at MCN, where she has worked for 14 years. She is the 2011 recipient of the Lorin Kerr Award, an American Public Health Association Award/Occupational Health and Safety Section Award which recognizes public health professionals for their dedication and sustained efforts to improve the lives of workers. MCN and Amy received the 2008 EPA Children’s Environmental Health Regional Champion Award for their innovate programs to help farmworker families minimize their exposures to environmental hazards. Dr. Mike Rowland served for 7 years as the Medical Director of the Maine Migrant Health Program and as Medical Director at Moses Lake Community Health Center in Moses Lake, WA. Board certified in Family Medicine and Occupational Medicine, Dr. Rowland has given numerous presentations at national conferences on occupational medicine and migrant health. He has previously served on the MCN Board of Directors. Dr. Rowland earned his MD from Tufts University School of Medicine and a Master of Public Health from Harvard School of Public Health. Much of the medical home model is predicated on a relatively stable population that can access regular care at a single network of providers. So how can this model effectively transfer to a mobile population? One of the key elements needed is a more expansive vision of a medical home beyond a single geographic location. This session will explore strategies to create a patient centered medical home for patients on the move. The session will include an update and overview of MCN’s Health Network to manage critical health care issues such as infectious disease, Cancer, Diabetes and Pre-natal patient navigations. Participants will also be engaged in a discussion around best practices in tracking outcomes and reporting test results to patients. Presenters will highlight innovative promising practices in the creation of patient centered medical homes for migrant patients. PRESENTED BY: Candace Kugel, FNP, CNM, Specialist in Clinical Systems & Women's Health and Melissa Bailey, Executive Director of North Carolina Field, Inc.
Any prenatal patient who may move out of your area before giving birth is eligible to be enrolled in the Health Network. MCN will provide care coordination throughout the course of her pregnancy, until her postpartum visit is completed, to help ensure that there are no gaps in her health care. 512-327-2017 or 800-825-8205. Pesticide Comic Book Order Form. The Perinatal/HIV Hotline: The National Perinatal HIV Consultation and Referral Service (Perinatal Hotline) provides 24-hour advice from HIV experts on indications and interpretations of HIV testing in pregnancy as well as consultation on treating HIV-infected pregnant women and their infants. The Perinatal Hotline (888-448-8765) is available 24 hours, seven days per week. Centering Pregnancy: A model of group prenatal care widely used in a variety of settings, including FQHCs and with immigrant populations. Materials are available in Spanish. Rural Women’s Health Project Pregnancy fotonovelas in English and Spanish. Wake Forest University One-page pesticides and pregnancy handout in English and Spanish. National Women’s Health Information Center. This website and toll-free call center were created to provide free, reliable health information for women everywhere, including lots of materials in Spanish. March of Dimes An array of materials at various literacy levels and almost everything in Spanish. Pamphlets, videos, "Comenzando Bien" curriculum. National Perinatal Association Published transcultural perinatal education curriculum. California Diabetes and Pregnancy Program. Catalog of patient education materials in English and Spanish for perinatal issues related to diabetes and gestational diabetes. “Diabetes gestacional: Guía para la mujer embarazada”. Spanish language guide on gestational diabetes from AHRQ. Historically, the field of women's health consisted of issues surrounding reproduction and childbirth. However, increasingly, the health care community has come to see women as a distinct patient group that has unique health concerns over a lifetime. Migrant farmworker women experience unique risks during pregnancy and otherwise, due to the physical demands, environmental exposures and other circumstances of their lives. The provision of healthcare services to migrant women presents distinctive challenges for both clinicians and organizations. MCN’s Candace Kugel, CRNP, CNM, and Melissa Bailey, Executive Director of NC FIELD, Inc., both with many years of experience with this population will discuss the problems, solutions and rewards of working with migrant women, through case illustrations and review of resources. Participants will be able to identify at least 2 health risks unique to women farmworkers and the impact of those challenges on work, nutrition and health. Participants will be able to describe environmental and occupational health exposures relevant to farmworker women of reproductive age. Case studies will assist participants in understanding how creative collaborations and models of care can improve health outcomes for migrant women. Participants will be able to access clinical resources for working with female migrant patients. Candace Kugel is a Family Nurse Practitioner and Certified Nurse-Midwife with over twenty years of experience in health care for the underserved. She has worked in various clinical settings, including family planning, migrant health, community health center, and private practice. She has worked almost exclusively in rural settings. Candace has also been active in aspects of health care other than direct patient services. She has served as a clinical instructor for nurse practitioner, nurse-midwife, nursing, and medical students, and currently has faculty appointments with the University of Cincinnati and Penn State University’s Schools of Nursing. She has worked in program development in various arenas, including co-founding a “Stork’s Store” prenatal incentive program, initiating a natural family planning education program, and teaching childbirth education classes. Melissa Bailey, Executive Director of North Carolina Field, Inc.
Melissa Bailey is a native of southern West Virginia. She has worked in North Carolina migrant education programs since 2001. In 2010 AFOP’s Children in the Fields Campaign assisted community workers with forming the nonprofit NC FIELD. This effort aimed to establish an organizational empowerment and advocacy model to build capacity in farmworker communities, particularly among child laborers in agriculture. In 2012 Melissa became the Executive Director of NC FIELD. She has presented to local, state, and national stakeholders; assisted media; has worked as a research assistant on farmworker studies; assisted with organizational development and the leadership training of child farmworkers, and is a successful field organizer, consultant, and project manager. Melissa holds a certificate in Nonprofit Management from Duke University, among other certifications related to the delivery of supplemental education services and data. In her spare time Melissa enjoys reading, writing, gardening, and spending time with loved ones. Clinicians play a critical role in the function and quality of care provided by Federally Funded Health Centers. This session will address the impact that clinicians have in overall health center management and function. Ed Zuroweste, MD, MCN’s medical director will discuss the overall culture of quality for Federally Funded Health Centers including the role of clinicians in Clinical Core Measures Review, the recruitment and retention of clinical staff, peer review activities, and the role of electronic health records in data gathering. The webinar will conclude with a discussion of the overall shift from productivity to quality outcomes. Identify at least 2 best practices in Clinical Core Measure review processes. Discuss the role clinicians play in effectively recruiting and retaining other qualified clinicians. Debate the impact of EHRs on data gathering for performance improvement. Identify the practical implications of a shift from productivity to quality outcomes for individual health center sites. Dr. Ed Zuroweste is the Chief Medical Officer for Migrant Clinicians Network. In this position, Dr. Zuroweste is responsible for the oversight of all of MCN’s clinical activities. He was present for the first “official meeting” of the Migrant Clinicians Network in 1985 and have been consistently involved with the organization since that time. Dr. Zuroweste began his work with migrants as a partner in a private practice in Chambersberg, PA. He later became the medical Director of Keystone Health Center, a large Migrant and Community Health Center in Chambersburg, Pennsylvania. While attending to his administative responsibilities, Dr. Zuroweste also maintained a full-time clinical practice in Family practive and Obstetrics, including full hospital privileges in Pediatrics, Adult Medicine and Obstetrics.